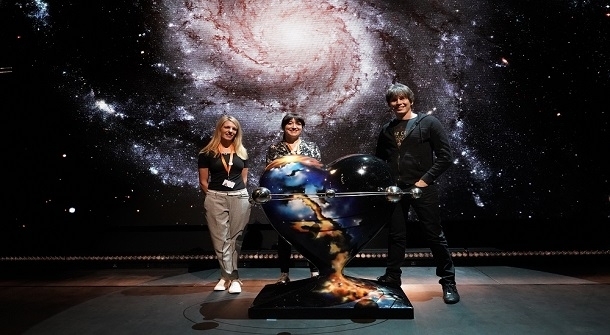 Professor Brian Cox, OBE, has shown his support for St Catherine’s Hospice HeART to Heart art trail ahead of its public launch this summer. Following sold out shows at the Hawth Theatre and the Brighton Centre, which explored the vast, possibly infinite universe and our place within it, Brian met hospice staff to admire the aptly named My Universe heart, which has been sponsored by Avensys Ltd, located on the Manor Royal. Designed by local artist, Johanna Paterson, My Universe was one of the first designed hearts for the trail. It was created to replicate the literal universe with the figurative meaning between loved ones when a person means everything to you. Johanna used a blend of colour to create a galaxy which highlights the enormity of love. Wire encircles the heart in four loops to create a 3D multi-sensory planet effect too. The HeART to Heart trail, sponsored by Thakeham, will give the local community a unique chance to follow a heart sculpture trail across Sussex and Surrey. Each heart has been custom designed by a local artist. The trail will be in place across the areas where St Catherine’s provides people with end of life care for around 10 weeks during summer 2019. An interactive app and trail map will encourage people to visit each heart to unlock its secrets. A community art project and secret heart exhibition will also run alongside the main trail which will be followed by a live auction. It’s hoped the trail will bring income and visitors to the local area.